Your art is really good though! Honestly I try looking at spriting as a form of drawing after I was friends with a very talented artist. It was what helped me see a bit farther in my spriting and details. Though I do admit i miss spots still due to excitement of wanting to show my work. What I still think is funny is how bad people still diss on MSPaint when I am using version XP on a daily basis. If I wanted to go into advanced stuff, I end up using paintdotnet as my secondary. Though there are still so many people that I see who are so much better and admirable in my eyes. Shame the stakeout didn't go as planned. Sadly, I would of agreed to the plan as well because it seemed like it made sense. I have thoughts on what could of happened, but I don't think it would have changed the outcome in any way. Thanks! I really enjoy seeing your sprites as well. I haven't done much pixel art myself, but it really is about trying to boil down what would be a normal drawing to it's bare essentials; so getting character and mood to translate in such a condensed manner is truly admirable! So just a heads up, releases might be a bit rocky because of the holidays coming up, personal issues and also being slightly burned out from getting all the Book 1 stuff done in time, I might be able to get one out for the weekend but it definitely won't be tommorow. Also been ill this week, havn't recovered as fast as I would have hoped... oh well. Xirix wrote: ↑ So just a heads up, releases might be a bit rocky because of the holidays coming up, personal issues and also being slightly burned out from getting all the Book 1 stuff done in time, I might be able to get one out for the weekend but it definitely won't be tommorow. Take all the time you need! I super appreciate all the work you’ve done thus far. Hope you get better soon! Oh boy, wasn't expecting to take more than 2 weeks off but things happen.. super happy to be editing again tho, I've kinda missed it. Regular schedule resumes today! Slight bit of confusion in communication, my fault. Just spoke with raocow on the discords, regular normal episodes resume today. Stream edits in the new year get hype? Xirix wrote: ↑ Slight bit of confusion in communication, my fault. Just spoke with raocow on the discords, regular normal episodes resume today. Stream edits in the new year get hype? Looking forward to hearing them and to make more stuff. Speaking of, I am curious on what will happen from here. A lot of options are starting to get cut. And this is bad since I tend to find openings and possibilities everywhere. There had been so many times where I thought, "If this was done instead" or, "There is still that possibility that they have." or how there was another option that wasn't thought of, but it maybe could have changed the outcome? But that's one of the reasons I love listening to these. I have no control and you all have creative outlooks that just makes this whole adventure spontanious and hectic, yet fun and on the edge of your seat. Just hope things will work out though. Looking forward to what is to come. Sharing the twitter link for this one since the file was too big. This wasn't originally meant to be like a strip, but I guess i committed to the idea haha. 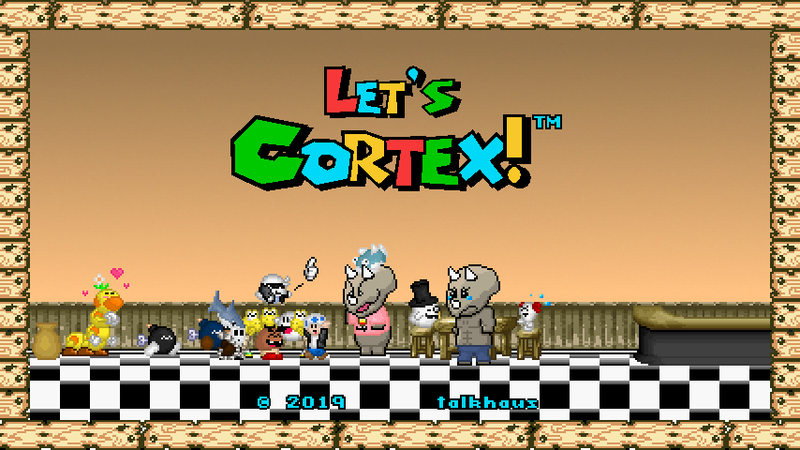 Yeah if you can say one thing about Cortex, it's not predictable. Far too many player variables, like with me I 'usually' try to do thought out plans but every now and then I just wing it, or do something because I'm in a weird mood... with varying results, there's some pretty interesting stuff coming up though. Oh huh, alright. Yeah that's quite possible, both species and gender has changed for some random NPCs over the sessions before, guess we all forget the small details sometimes. But yeah, it's not usually important what species the characters are, so it's not that big a deal. I can still pick out who is what from a short location or time frame and wish I had the time to make and spread out the sheets for every character made. Though finding the character and names from the ASMT universe is the toughest for me due to recent events. Well thankfully we weren't in ASMT for 'too' long, but yeah it can be hard to find the names of some of the less common enemies. One of the streams involves Toasterbots, I think I had to just skim through raocow's videos or something just to get a picture of the sprite. Someone get on an ASMT wiki thing to mirror the mario wiki! Xirix wrote: ↑ Well thankfully we weren't in ASMT for 'too' long, but yeah it can be hard to find the names of some of the less common enemies. One of the streams involves Toasterbots, I think I had to just skim through raocow's videos or something just to get a picture of the sprite. I think that is already a thing. But otherwise, can't find much else. I was also hoping to pull sprites off the ASMT hack, but all I seem to find are broken or something.Asides from that, the latest episode has me inspired and working on a new title card scene for you guys. I just thought it was too good to pass up. Hopefully I'll get it done later or tomorrow. edit: I'm starting to realize the site is a bit outdated from exploring a bit. Considering i'm quite behind, the fact that a reznor can have abs is the most shocking fact of all of this. Also, great work as usual! Bahaha I'm sitting here cracking up. I love that scene and that it got immortalized! I love the art of everyone carrying Jakey Boy lol. And I actually forgot this scene even happened! The dialogue is kind of wonderful though (but that may have to do with your giving it voice through your amazing art). Keep up the amazing work you two - we all really appreciate it! Both of you get brought up a lot in sessions since we love your work! The Destroyer of Worlds wrote: ↑ And I actually forgot this scene even happened! The dialogue is kind of wonderful though (but that may have to do with your giving it voice through your amazing art). Thanks horikawa! (or uh, destroyer?? i'm not sure what to call you anymore lol.) Part of the reason why I do these is to make a little something for each step of the way which can server as a bookmark of sorts, so it's fun when people remember stuff because of it. Just a heads up, this week's episode is delayed until friday/saturday as some real life stuff came up that needs my attention, so don't freak out, I don't intend to miss any more weeks. The Destroyer of Worlds wrote: ↑ Keep up the amazing work you two - we all really appreciate it! Both of you get brought up a lot in sessions since we love your work! Honestly, when I was just making the sprites just for fan work, I wasn't expecting them to be used as a screen cap. But the fact you are all enjoying it and using them for these sessions. it gives me something to do and a build up for what i hope to start dishing out some day. I really enjoy listening to these and figuring out the plot along with you all (though yeah, these are edited and posted maybe months behind) But I keep seeing little gaming moments from the group as well. I wish i was able to pull off better requests and stuff (like Hannah struggling with the children's book). Or maybe just try to "photograph"a moment for you all to memorize and just laugh about. I also do it in a way to help the others take a little more time on their fan arts as well, so they don't feel dead lined maybe? All in all seeing the stuff used and the praise lifts my spirits from personal life as well, and it's my way to root for you all to keep having fun and enjoy yourselves as much as i have been enjoying listening to them. But yeah....that's probably enough out of me now. Xirix wrote: Just a heads up, this week's episode is delayed until friday/saturday as some real life stuff came up that needs my attention, so don't freak out, I don't intend to miss any more weeks. Delays or not, don't pressure yourself too much. Everyone's safety is always a priority in my books. Just hope everything is going well and getting back to normal. Kellins wrote: ↑ Delays or not, don't pressure yourself too much. Everyone's safety is always a priority in my books. Just hope everything is going well and getting back to normal. I appreciate that, but nah it's all good, with the holidays over and other obligations done now I'm trying to get a stockpile of episodes going, getting back into the swing of things.